Fish oil: what is it, what are the benefits, and should you be taking it? Fish oil is one supplement with a history that starts before the modern pharmacy: traditional cultures have been eating some form of fish oil (usually fermented) for hundreds of years. Most people have a vague idea that fish oil contains Omega-3 fats, which are good for heart health, but this kind of nebulous assumption isn’t a very useful basis for making important health decisions. It might be tempting to just grab the first bottle off the shelf and take whatever the recommended dose is (fish is Paleo, and oil is fat, which is definitely Paleo, so it must be good for you…right? ), but in the case of fish oil, it’s important to understand what it is and how to find a good brand. A bad quality fish oil can actually be worse than no fish oil at all, and some people don’t need to take any, so make sure you know enough about the benefits and risks to make an informed decision. The major benefit of fish oil is that, like fish, it contains high levels of omega-3 Polyunsaturated Fatty Acids (PUFA). This can be confusing to some people, because it’s generally recommended to limit PUFA intake as much as possible, so deliberately supplementing with it seems counterproductive. But it’s also important to pay attention to the kind of PUFA you’re getting. 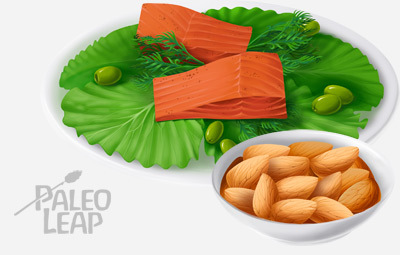 Specifically, there’s a difference between Omega-3 and Omega-6 fats, and most people in the modern world don’t get nearly enough Omega-3s, so supplementing with them can actually be beneficial. Unfortunately, even though it’s important to understand the difference between these two types of fats, the names used are often extremely confusing. The table below breaks down the most common names you’ll see for both types of fatty acids – as you can see, it looks much more complicated than it really is because most of the names are just alternate ways of referring to the same two things. *The reason why some people use a w instead of an o is that the Greek letter Omega (ω ), which is the full scientific name of these fats, looks like the English letter w but sounds like the English letter o.
Biologically, the difference between O-6 and O-3 fatty acids is in the molecular structure of the fatty acid. Fats are arranged in chains: think of a fatty acid as like a train, where each train car is a carbon atom. The “engine” of the train is a different group of molecules called an acid group. When you read about “short,” “medium,” or “long-chain fatty acids,” you’re seeing information about how long the tail of carbons is. In the O-6 fatty acid, the first double bond (represented by the = sign) is between the 6th and the 7th carbon, counting from the end. In the O-3 fatty acid, the first double bond is between the 3rd and the 4th carbon. All of this information about different kinds of fats is biologically interesting, but what does it have to do with health? The answer, in a word, is inflammation. PUFAs are very important mediators of inflammation, because they regulate the production of molecules called eicosanoids, which control the inflammatory response. Arachidonic acid and its precursor linoleic acid (both types of O-6 PUFAs) are major producers of eicosanoids. O-3 PUFAs, on the other hand, are anti-inflammatory, because they counteract the inflammatory action of their O-6 cousins. Supplementing with O-3 PUFA causes some O-6 PUFAs to be replaced by O-3. This gets in the way of the O-6-to-eicosanoid conversion, so it reduces inflammation. O-3 PUFAs do produce some eicosanoids of their own, but the varieties of eicosanoids produced by O-3 fats are much less powerful than those produced by O-6 fats, so comparatively, O-3 fats are much less inflammatory. Researchers have also found that O-3 fats are anti-inflammatory in a number of other different ways – they generate a type of anti-inflammatory mediators called resolvins, and decrease the production of inflammatory cytokines. They also reduce oxidative stress by lowering the production of reactive oxygen species (ROS), which are harmful free radicals strongly associated with aging and degenerative diseases. These general anti-inflammatory properties make fish oil a promising supplement for an astonishingly wide range of conditions. While it’s most commonly associated with the cardiovascular system (improving the blood lipid profile and protecting against heart disease), many people swear by fish oil for any number of problems and illnesses that don’t seem to have much to do with the heart. The official NIH supplement page reads like a medical encyclopedia of common degenerative diseases, from depression to pregnancy complications to asthma. This should come as no surprise to anyone familiar with the role of inflammation in the chronic infections and diseases that often underlie these long-term health conditions. Systemic inflammation is both a cause and a symptom of many of these degenerative disorders, so it’s not surprising that reducing inflammation by balancing the body’s ratio of O-6:O-3 fats brings relief for a variety of different problems. The studies make it seem like supplementing with O-3 rich fish oil will be helpful to everyone, but this isn’t actually accurate, because judging the results based on O-3 consumption alone is misleading. O-6 intake is also very important, and there’s a big difference between the O-6 levels of a conventional diet and a Paleo diet. For most of human history, the dietary ratio of O-6 to O-3 was probably fairly low – between 4:1 and 1:1. Herbivores (like cows) and aquatic animals get O-3 fats from green plants (grass and algae), so when grass-fed meat was the only meat around and soy oil hadn’t been invented yet, most people maintained a healthy amount of O-3 fats in their diet without even knowing what they were. Unfortunately, with the advent of seed oils, industrially processed fats, and grain-fed factory farming, the ratio of O-6:O-3 in the human diet skyrocketed. Vegetable oils like corn, soy, or peanut oil are very high in O-6 fats, and provide an alarming proportion of the energy in the standard modern diet. Grain-fed meat is also much higher in PUFA and especially O-6 PUFA. These new and artificial staple foods have sent modern consumption of O-6 PUFA through the roof – today’s ratio is variously calculated as between 10:1 and 20:1. In contrast to this, Paleo food is very low in O-6 PUFA, so there isn’t such a pressing need to balance it out by supplementing with Omega-3s. Studies showing huge benefits of O-3 supplements for people on a modern diet aren’t necessarily applicable to Paleo dieters, who don’t have nearly as much damage and inflammation to correct. This doesn’t mean that Paleo completely eliminates the need for an Omega-3 supplement, but it does require a more individual analysis. If we could all eat a diet of purely grass-fed meat and wild-caught fish all the time, nobody would need to take fish oil. Some people who enjoy eating fish on a regular basis might not need to supplement at all – they can get all the Omega-3s they need to balance their O-6 consumption without having to worry about finding a good supplement. Since they’re eating so little O-6 PUFA compared to most people on a modern diet, they don’t need any supplemental O-3. Other people might be trying to recover from a lifetime of excess O-6 consumption, or might not be able to get enough fish in their diets – if this is you, a high-quality fish oil supplement can be a great idea, especially during the transition period from a conventional diet to Paleo. Regular fish oil is beneficial enough, but many people are also curious about fermented cod liver oil. Fermented cod liver oil isn’t a replacement for fish oil if you’re looking for Omega-3s, since it doesn’t actually contain a very high concentration of them. On the other hand, it’s an interesting addition to your diet for other reasons, most notably its micronutrient content. Like liver, cod liver oil is a potent source of many important vitamins and minerals, especially Vitamin A, Vitamin D, and Vitamin K2. Also, fermentation is much gentler than the processing methods used in other types of fish oil, because it’s done at a lower temperature. Essentially, it mimics the process of digestion that would take place in your own stomach, so it breaks down the nutrients in the oil into a much more natural and bioavailable form. Even though fermented cod liver oil doesn’t have as many Omega-3s as regular fish oil, it does have some, and the fermentation process helps to preserve them as much as possible. This is important because one of the reasons why PUFA are so inflammatory is that they’re very fragile. They’re easily damaged by heat and oxygen. Fermentation is much gentler on the Omega 3s in the oil, so they’re much more likely to still be beneficial when they get to you. Ultimately, a cod liver oil supplement is more of a multivitamin than an Omega-3 boost. If you can’t eat liver regularly, or if you’re struggling to get enough Vitamin D, it’s a possible alternative to commercially processed supplements, but don’t expect it to affect your PUFA balance in the same way that regular fish oil does. If you’ve decided that supplementing with fish oil might be right for your health goals, the next step is to find a supplement – unfortunately, this is easier said than done. Remember that one reason why PUFAs aren’t as healthy as saturated or monounsaturated fats is that they’re are very unstable and tend to go rancid easily. Supplementing with oil that’s gone bad will you do you more harm than good. Some people try to circumvent this problem by taking flax seeds as a supplement instead. 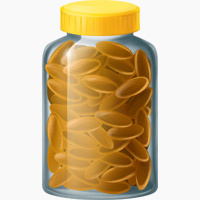 This isn’t harmful (there’s nothing wrong with flax seeds), but it’s very inefficient, because flax seeds don’t actually contain the two major types of O-3s that we need. Instead, they have a precursor – a different fatty acid called ALA that can be converted to DHA and EPA. Since it’s much more efficient to take DHA and EPA directly, fish oil is usually a better choice for supplementing than flax seeds. This brings us right back to the problem of where to get it. Since fish oil is so fragile, buying whatever you see on sale at CVS doesn’t cut it. It’s better to not take a supplement at all than a lousy one (especially if the lousy one is an “Omega 3-6-9 blend:” you’re trying to eat fewer O-6 fats, not more!). For regular fish oil, look for one that doesn’t contain any weird additives or sweeteners; if you can’t manage to choke the oil down straight, several brands come in capsules (although this is more laborious since you have to take several capsules to get the recommended daily dose). To avoid forcing yourself to swallow any more fish oil than you have to (and to keep your total PUFA intake reasonable), try to find a brand that’s as concentrated as possible. Judge your fish oil based on the total EPA and DHA content, not the total amount of O-3s; EPA and DHA are the most helpful types of Omega-3, so those are the ones you should be trying to maximize. Make sure you get it from a store that handles the oil correctly – it should be stored in a refrigerator in the dark, not left out on a shelf to go rancid. For fermented cod liver oil, the choice is simple as there’s only one company that makes it: Green Pasture. 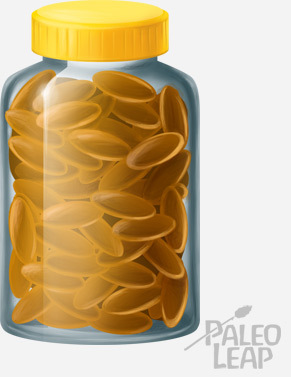 Their cod liver oil comes in several flavors, and they also sell it in capsule form. for regular fish oil, Carlson labs, Nordic Naturals, and Stronger Faster Healthier are all choices to consider for ordering online, or look for a brand you can get locally that meets all the criteria above. Whatever brand or type of fish oil you take, make sure to treat it properly once it’s in your hands – keep it somewhere cool and dark (like your fridge), and check it regularly to make sure it hasn’t become rancid. To check for this, just open the bottle (or split open a capsule) and smell it: if you smell rotten fish, throw it out. The answer depends on your O-6 consumption. Remember that the ratio of O-3 to O-6 fats is just as important as the absolute number of those fats, so just counting O-3 alone won’t give you the whole picture. To get a rough idea of how much O-6 you consume every day, use this table to check a few of the foods you commonly eat. There’s no need to start measuring every meal down to the gram; all you really need to do is get a rough approximation. For example, maybe you usually eat a 3-egg omelet for breakfast, chicken for lunch, and ground beef for dinner. For the eggs, that would be just over 2g of O-6 (assuming 1 egg to be approximately 50 grams); for the chicken it would be approximately 5g (for a 6-ounce portion of chicken), and for the beef it would be close to 0.75g (for a 6-ounce portion of ground beef). All told, that comes to approximately 8 grams of O-6 PUFA for a fairly unremarkable day of Paleo eating. If you like to snack on nuts, this number can climb fairly quickly. One serving of almonds, for example, contains over 4 grams of PUFA, so adding just one snack to your day can increase the PUFA intake above by 50%. But in general a Paleo diet will keep PUFA intake to within a healthy level (less than 4% of calories) without much special planning or effort. To maintain an optimal ratio of O-6:O-3 in the diet (between 4:1 and 1:1), you’ll probably want to adjust both intakes – reduce O-6 so you don’t have to worry about supplementing with so much O-3. This is much more beneficial than taking megadoses of O-3 to make up for a high O-6 intake; remember it’s best to minimize consumption of all kinds of PUFA as much as possible. Fish oil isn’t a “get out of jail free” card for a diet loaded down with O-6 fats. Take as many grams of O-3 as you need to balance your O-6:O-3 ratio, and resist the urge to overdose: more is not better! A Paleo diet low in O-6 fats doesn’t necessarily eliminate the need for Omega-3 supplements, but it does come pretty close. Since the main reason for supplementing Omega-3 fats is to counteract the damage of Omega-6s, a diet without any factory farmed meat or seed oils just doesn’t require much, if any, Omega-3 supplementation. If you eat fish regularly, and keep a fairly strict Paleo diet, it’s probably not necessary to take fish oil as an O-3 supplement, although you might be interested in fermented cod liver oil for its micronutrient content. For people who do think they could benefit from more dietary Omega-3s, finding the right supplement is crucial. Finding a brand that’s rich in DHA and EPA, doesn’t contain any strange additives or non-Paleo ingredients, and that has been stored and treated properly is well worth the effort.